Interested in becoming an interior designer? TBH, that's kind of our dream job — constantly redecorating, flexing our shopping muscles, getting to meet cool people. Well, there's good news: Designer salaries are on the rise. According to the 2019 Interior Design Compensation Report by the International Interior Design Association (IIDA), a group supporting commercial designers comprising 15,000 members from 58 countries, the average salary for a designer has gone up significantly. The IIDA surveyed some 2,000-plus members, asking questions about their income, benefits, and education and found that from 2016 to 2018, designers' salaries rose 6.6 percent — from $73,330 to $78,100. Our first thought after seeing those figures was: Wow. 6.6 percent is a nice increase, and also $78K is a pretty impressive average. But that number doesn't quite tell the whole story. 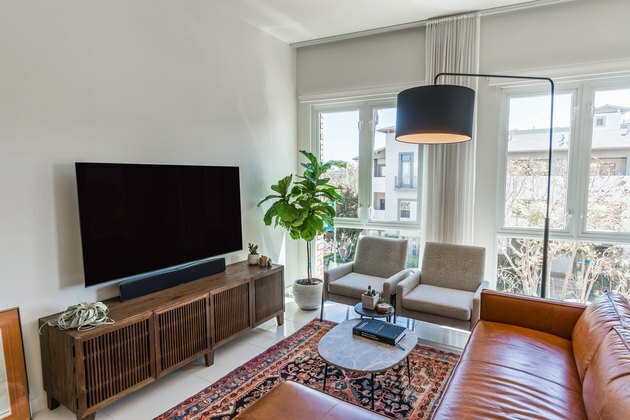 "The increase in average annual salary is commensurate with the economy in general," says IIDA Deputy Director and Senior Vice President John Czarnecki. " ... [T]he increases in salary are in relation to continued economic growth and a healthy design industry in that time period." But what about the economy right now? We're seeing stagnation. According to the Society for Human Resource Management, "Salary-increase budgets for U.S. employers [in 2019] are projected to grow by just 0.1 percent above the actual average budget increase for 2018 ... "
It's difficult, of course, to make blanket statements about average salaries when sampling a global population, given drastically different economies across the world. 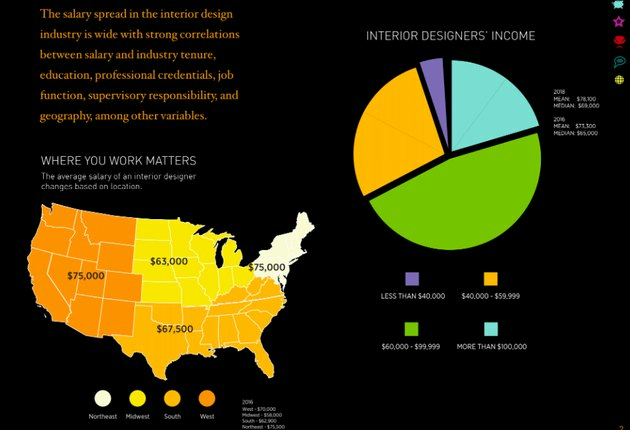 Even within the U.S., there are regional disparities in average salaries for designers. According to the IIDA report, the average designer salary is $75,000 in the Northeast and the West, while it's just $63,000 in the Midwest. 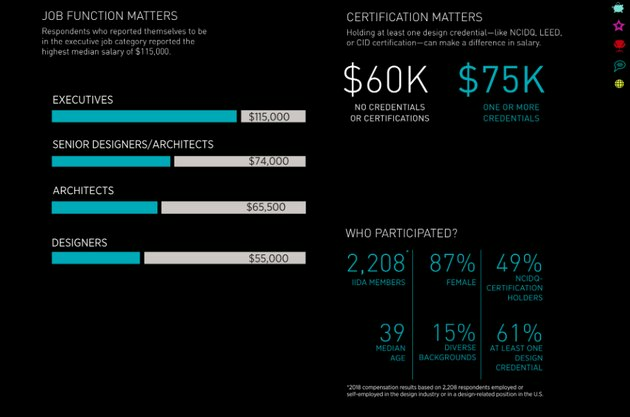 The IIDA's report does, however, give some more concrete insight into another aspect of designers' pay: designers with advanced degrees or extra certification (beyond a bachelor's degree) make a median salary that's $15,000 higher than designers without those credentials. Cotter Christian, assistant professor of interior design at Parsons School of Design in New York, says there might be some self-selecting bias within this group — many designers who pursue additional credentials or certification often have a stronger drive to excel within their fields than those who don't. "Going back to grad school just because you want to make more money is probably not a reason to do it," says Christian. "But going back to grad school because you want to pursue a question or learn more about something specific demonstrates a kind of passion and enthusiasm about that topic. It relates to your willingness to become an expert in that area, which of course will garner recognition in the field and may translate to extra income." Christian advises young designers who have just earned their undergraduate degree to enter the field first to gain hands-on experience, especially with regard to working with clients, before considering the option of further study. "Having that exposure to the field firsthand can really help students grow and mature by helping them understand what type of designer they want to be and understand the advance knowledge they want to obtain," he says. "Students who come back to graduate programs who have a strong agenda of what they want to study are often more successful in those programs because they can focus on their research in a targeted way." And if graduate school is not in your cards, there's no need to sweat it. There are other ways to demonstrate passion and develop new skills within a niche that don't come with student loans — and can still equate to a level of expertise that might ultimately drive up your income. "One thing that can't be overstated is the need to have an interest in something outside of design," says Christian. "I think sometimes the strongest students that we have that in undergrad have a passion for other things, too — they may be really interested in psychology or travel or food or business. Having that gives designers a new place to search for inspiration, and the opportunity to communicate with people outside the design world in a language other than design." Ultimately, wide-ranging interests can help designers develop a more well-rounded approach to their work, as well as help them discover a niche that suits them best. So becoming an expert in that niche doesn't necessarily have to revolve around graduate studies. Of course, a designer's success isn't necessarily measured in salary, per se — like in many creative industries, success is very much in the eye of the beholder. And, according to the IIDA report, 78 percent of designers surveyed indicated satisfaction with their careers — a strong indicator of one kind of success. That said designers have to eat! So seeing any salary growth at all is a positive thing. "As a public statement about the field and the legitimacy of interior design as a profession, the 6.6 percent salary increase is a great message to be able to put out," says Christian. "I do think people are recognizing the profession more and that we're offering a service that is an expertise and a specialty, though it would only be speculation that that's contributed to the increase."